Advanced training workshop in stone tool artifact identification. Recording site features in the Sierra Nevadas. Workshop participants take a short hike to a site in Joshua Tree National Park. The field mapping at San Bernardino National Forest ended early because of heavy rain. Photo by Doug Guimond. Advanced training workshops provide training and experience in skills that are useful for CASSP volunteers. These workshops may last one or two days, and usually combine lectures and other presentations with hands-on practice. Topics in previous advanced workshops have included preparing site sketch maps (to scale), use of hand-held GPS units, recording techniques for rock art, faunal identification, flintknapping demonstrations, historic and prehistoric artifact identification, and field survey techniques. 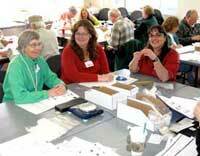 Advanced training workshops are constructed to help current volunteer site stewards. Volunteer confidentiality agreements may have to be updated or renewed if the workshop includes sensitive site information. Registration is required for advanced workshops. Usually space is limited, so please register as soon as you can. (updated March 26, 2016) On May 14-15, the Inyo National Forest Supervisor's Office with the BLM Bishop Field Office co-host an advanced workshop that features two days of hands-on learning in the field concerning two topics. One day will focus on rock art documentation and drawings (led by David Lee of Western Rock Art Research). The other day will focus on site mapping and feature detail drawings. We will also do some advanced GPS training. Volunteers are encouraged to bring personal GPS units if they have them. We will spend some time in the office downloading GPS data and making maps. The office is located at 351 Pacu Lane, Bishop, CA 93514.